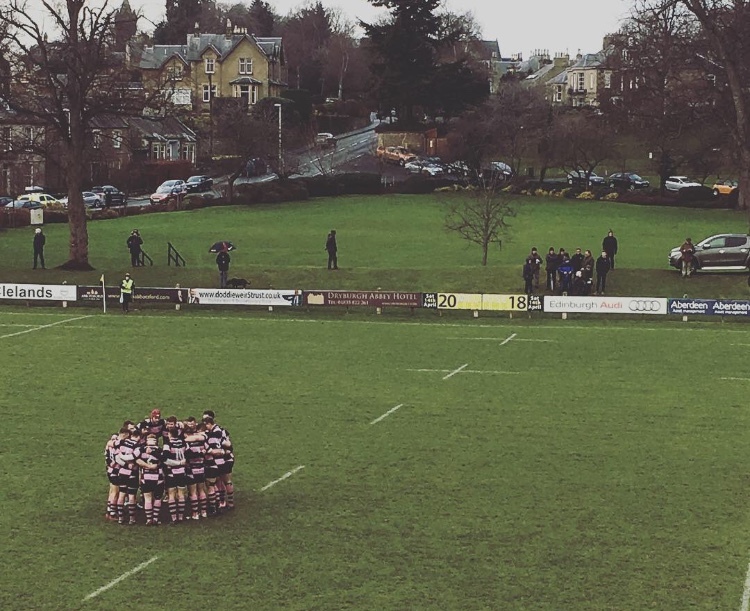 Ayr inflicted Melrose's first defeat of the season yesterday with a 12-20 victory at the Greenyards. The two sides saw plenty of each other in 2017 and the first action of the new year proved to mimic the ferocious intensity which has become a trademark of the fixture in previous games. Ayr's youngsters showed how menacing they can be in the opening phases with Paddy Dewhirst wriggling along the touchline and Scott Lyle nailing a perfect kick for touch. Ayr won a penalty from the following line-out which Lyle sent back into the crowd. A catch and drive put Steven Longwell over the line- Scott Lyle converted making it 0-7 after just five minutes. Straight from the restart Melrose looked to bounce back, but after building multiple phases a stray pass wandered forward allowing Ayr to get rid of the threat. The next breakthrough came in the 20th minute, when another Melrose penalty allowed Lyle to kick to touch. Ayr aimed to drive but intense pressure from the home side forced a knock-on allowing Baggot to clear his lines from a scrum. Melrose began to build, playing more like the side we have become accustom to this season. Momentum was in their favour when a yellow card to Grant Anderson gave them a big penalty opportunity- they went to the corner. George Taylor scored in the following play, with centre Craig Jackson evening the score. Ayr received another big blow minutes later with Jonathan Agnew being sent to the bin for a late tackle. Melrose grabbed their second try just after, with Richard Fergusson falling over from a maul- Jackson pushed the conversion wide which brought the scoring to 12-7. On the stroke of half-time Lyle got a chance to scrape back the deficit when Melrose were marched back 10 yards on a penalty, bringing him into kicking range- he made no mistake, 12-10 at half-time. The second half continued with the same intensity as the first, David Armstrong proving to be the ever-present thorn in Melrose's side- they had no answer for him. He conducted Ayr's backline deep into Melrose's 22 but the attack dwindled with another knock-on. Melrose didn't capitalise however and utterly dominating scrummaging from Ayr won a turnover and a penalty- realising how commanding they were in this area, Ayr opted for another scrum on Melrose's five metre line. The next ten minutes of play began to get repetitive with Ayr winning four penalties in a row from the scrum. Everyone at the Greenyards attention turned to the possibility of a penalty try, but referee Keith Allan was reluctant to give, instead sending McLeod to the sin bin. On the fourth scrum Ayr decided to break and bulldozing carries from prop pairing Steven Longwell and Robin Hislop inched them closer and closer to the line. A try looked imminent, but the ball was lost forward and somehow Melrose had escaped the barrage unscathed. Ayr weren't rattled by coming away empty handed and the next five minutes continued in the same vein as before, with Melrose constantly pushed deep into their own half. Ayr's breakthrough came just after the sixty-minute mark when a chip from the Melrose full-back Fraser Thompson landed in the hands of Craig Gossman. Gossman darted back at Melrose before a perfectly timed offload put Rob McAlpine through the defensive line. The home side tried to bring him down but a massive hand-off was enough to spring him forward for the score. Scott Lyle maintained his 100% strike rate to bring the scoring to 12-17. After barely touching the ball in the second half Melrose's heart started to show and they mounted an attack in the last ten minutes which almost mimicked the gut-wrenching closing stages of last year's final. Their chance came with five minutes left to play when a penalty gifted Baggot a kick to touch inside Ayr's 22- but errors cost them again. A faulty throw in brought to an end Melrose's biggest opportunity of the half, and Ayr could enjoy possession again. The final nail in the coffin came in the dying embers of the match when a composed Scott Lyle slotted three more points to take the result away from Melrose- this would conclude the scoring. After 12 rounds of rugby dominance league leaders Melrose had been toppled by a familiar foe, Ayr took it 12-20. The 2nd XV were in action at Old Anniesland against Glasgow Hawks 2nd XV. The game swung like a pendulum with neither side able to keep the other at more than arms left. In the end it was Hawks who toughed it out 31-25 but Ayr picked up two big bonus points in the process. Ayr's 25 came from tries by James Pinkerton, James Armstrong, Lewis Young and Jamie Bova. Armstrong also added five points from the boot.